Anders Hillborg fits quite snugly into the standard mould for contemporary Scandinavian music. He's Swedish, but like many of his Finnish contemporaries, he is into wide orchestral vistas, long pedals with sudden bursts of activity over the top, extrovert percussion writing, glassy harmonies that sit somewhere between Impressionism and Minimalism...If you know the music of Magnus Lindberg, Sebastian Fagerlund or Esa-Pekka Salonen, you'll know what to expect here. 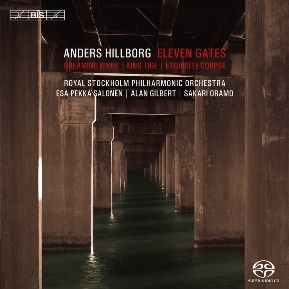 Like those composers, Hillborg continually tries to marry Modernist techniques with an otherwise populist sensibility, and American minimalism is an important precedent to which he continually returns. The first work on the disc, King Tide, uses repeated semiquavers, with each of the repeated note lines appearing from silence, growing and then contracting again. There is clearly an element of klanfarbenmelodie here, a legacy perhaps from the composer's electronic music days, but Steve Reich’s Desert Music is much closer to the surface than anything by Schoenberg. The issue of form in these pieces is very interesting. There is no traditional structure in the sense of reprises or recapitulations, and instead the form of each of the works has an almost narrative quality. The music is usually quite associative, if not actually descriptive, and a clear progression takes place, which usually justifies the relatively long durations. That said, from a structural point of view, the most successful work on the disc is the last, Eleven Gates, and that is because it is written in 11 short movements. The textural and harmonic relationships between the movements ensure work's coherency. The two central works, Exquisite Corpse and Dreaming River, also seem to be based on sectional forms, although not as explicitly articulated. Hillborg's approach to orchestration is original, and is usually based on densely woven combinations of unrelated timbres. Solos are rare, but even though the textures usually involve a large number of players, there is still plenty of variety in terms of both timbre and volume. Ligeti is clearly an important influence on Hillborg's orchestration, especially the works of the late 60s and early 70s, like Lontano and Melodien. Hillborg has an excellent ear for percussion, which is also evident in these two central works. Considering the size of his percussion sections, it is also impressive how well he integrates the percussion writing into the rest of the orchestra. Although the same orchestra, the Stockholm Philharmonic, perform on each track, the conducting responsibilities are shared between Sakari Oramo, Alan Gilbert and Esa-Pekka Salonen, all of whom are very familiar with both the orchestra and the composer. It is difficult to asses how much interpretation this music requires, the orchestral textures perhaps need careful balancing, but the phrase structuring speaks for itself. Nevertheless, the performances are all very good, and each conductor succeeds in evoking the appropriate sense of atmosphere, an essential ingredient in this music. The sound engineering is good, with excellent clarity of texture from within the orchestra. BIS are to be commended for presenting so much contemporary music in SACD format. They are about the only major label to do so, and this disc demonstrates as well as any the advantages the technology can bring to intricately orchestrated new music.